Rank flags of Ukrainian Navy flag officers (cf my presentation dated this summer on NAVA Website) - at my knowledge,these flags were valid in august 1998, and were changed since. Flag of the commander in chief. This image is based on navy flags chart (navy flags since 2000) from the book and was translated by Andriy Grechvlo as: "Naval flag of Ministry of Defence". Flag of the Minister of Defence. According to L'Album 2000 [pay00] - Minister of Defence (2:3) - Similar to the holiday naval ensign (white flag with cotized blue cross and the national bicolour in canton) defaced with the simplified CoA over the center. The flag is different from the holiday ensign in that that it includes a white fimbriation between the bicolour and the cotize of the cross. This image is based on navy flags chart (navy flags since 2000) from the book and was translated by Andriy Grechvlo as: "Chief of General Staff of Ukrainin Navy". This image is based on navy flags chart (navy flags since 2000) from the book and was translated by Andriy Grechvlo as: "Chief of Navy". 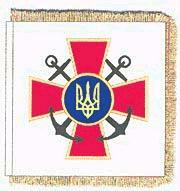 Flag of Commander of Navy Forces. The Navy Commander flag is actually a gonfalon as seen here, also established by this same Decree, Decree No. 705 of September 3, 2009. This flags is a standard, to indicate owners presence somewhere (on land, typically), while the upper flag is a naval signal to be hoisted at mainmast (or other prescribed site) when certain dignitary is on board. The standarts just too complex to be used as naval signals. They are also, I guess, to be made as unique flags (just as standards would be) as the inticate ornamentation surely indicate. This Standard of the CinC of the Navy is based on those. According to Album 1990's issue Corr. 29 [pay97b] -Naval Commander - White flag with blue cotized cross and three fivepointed stars in canton. I.e the naval ensign with the canton replaced with three blue stars. The stars are of "fat" kind, i.e. the inscribed circle diameter is half the circumsribed circle diameter. Of course, the stars are one above two. Note on the page says for this flag to be unconfirmed. Flag of Assistant of Commander of Navy Forces. This image is based on navy flags chart (navy flags since 2000) from the book and was translated by Andriy Grechvlo as: "Chief of Naval Staff". Nozomi has sent me a photo of the emblem to improve it, but the blue in the photo looks much darker than it did in the first source, and the fimbriation of the Ukrainian national flag canton differs also. According to L'Album 2000 [pay00] - Chief of Naval Staff (unconfirmed) (2:3) - Similar to the holiday naval ensign (white flag with cotized blue cross and the white fimbrated national bicolour in canton) with three blue fivepointed stars, one in each of the remaining white quarters. This image is based on navy flags chart (navy flags since 2000) from the book and was translated by Andriy Grechvlo as: "Chief of naval squadron". According to L'Album 2000 [pay00] - Deputy Chief of Naval Staff (unconfirmed) (2:3) - Similar to the holiday naval ensign (white flag with cotized blue cross and the white fimbrated national bicolour in canton) with two blue fivepointed stars, one in each of the fly white quarters. This image is based on navy flags chart (navy flags since 2000) from the book and was translated by Andriy Grechvlo as: "Chief of unit". According to L'Album 2000 [pay00] - Brigade Commander (unconfirmed) (2:3) - Similar to the holiday naval ensign (white flag with cotized blue cross and the white fimbrated national bicolour in canton) with one blue fivepointed star in the fly top quarter. Flag of commander of navy region. According to Album 1990's issue Corr. 29 [pay97b] - Naval Region Commander - White flag with blue cotized cross and two fivepointed blue stars in canton. Album does have the image but description that reads "avec deux etoiles accolees". I think that the last word means something like "next to each other", i.e. horizontally layed. Note on the page says for this flag to be unconfirmed. Flag of Commander of group. According to L'Album 2000 [pay00] - Group Commander (unconfirmed) (2:3) - White swallow-tailed flag with cotized blue cross. According to Album 1990's issue Corr. 29 [pay97b] - Naval Group Commander - White flag with blue cotized cross and a fivepointed blue star in canton. Note on the page says for this flag to be unconfirmed. According to Album 1990's issue Corr. 29 [pay97b] - Division Commander (2:3) - Swallow-tailed white pennant with blue cotized cross and the simplified CoA in canton. It is entirely like in 2000, but for the CoA which is not confirmed anyway.